Brilliantly done! A (relatively) cheap and quick project that makes a world of difference. WAHOO! I'm happy that you went with that style -- it's so pretty! And WOW! Talk about a gorgeous and fast installation! GO BANE! Thank you! Yes, I'm glad I decided on that style. A more ornate style would have been too much for the small room. I wish more of my projects could be that fast and easy! But now I wanna think about the ceiling. It looks amazing. I'm going to svae up and do my bedroom ceiling I think- because looks way easier than stripping the woodchip wallpaper off and re-papering! It's great to be able to just put the new right on top of the old. :) Much easier! I think you made the right choice keeping them solid white. Simple elegance! Mr. Kitty just recently installed crown molding in our downstairs. We used the polyurethane stuff and it was super easy to work with. He said it cut like butter, and the edges were amazingly clean. He did cheat and use the fancy corner pieces so he didn't have to worry about the complex upside-down-and-backwards angles (plus we have some outside corners that are bullnose [blech] so that would've led to a bunch of 22 1/2 degree cuts - not his idea of a good time). I love simple projects like that that have such huge impact! You've inspired me to do another post on my home, even though it's a bit off-topic for my blog. I must take some photos this weekend! Home post! Home post! :D It would be lovely to see more of the Kitty manse! What a great idea! It looks really awesome. someday I will own my own house and I will return to your archives and glean ideas like a crazy person! Great! :) I love when my blog is useful to someone. 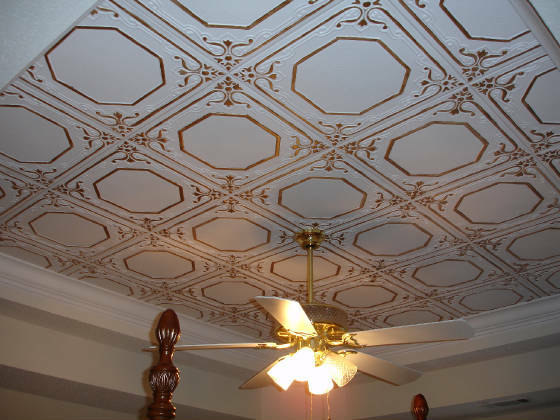 I love a good ceiling-- it has so much depth to the room. I am in love with the choice of tile you picked. So. Damn. Beautiful! Your post is very useful to the user as you explain in great detail how did you do it. 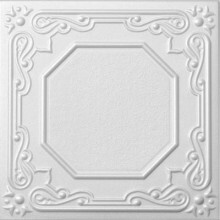 I have came to your site as I have seen some traffic on our site decorativeceilingtiles.net coming from your site and I am pleased that you are happy with the product and your new ceiling. Thank you for shopping on our site and for making this post. Thanks for the comment. I received good service and fast shipping from your company, and I'm happy to post about the success. This turned out absolutely amazing! I remember when you posted about it before and were trying to decide what to do. I really turned out great. I was just curious if this actually has lasted and you haven't had any falls.